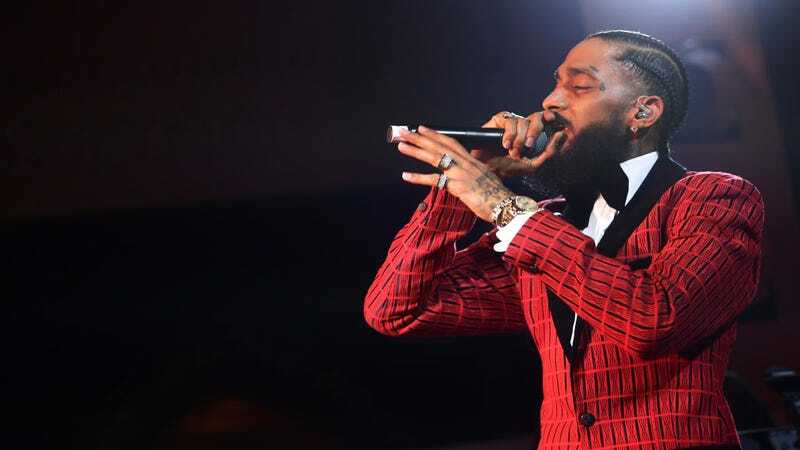 Grammy-Nominated Rapper Nipsey Hussle, born Ermias Joseph Asghedom, has died after being shot multiple times while standing outside of his Marathon Clothing Company store in the Hyde Park section of Los Angeles. Asghedom’s shooting was initially reported by TMZ. Asghedom was 33. He was known for a run of mixtapes that began in 2005 with “Slauson Boy Volume 1,” culminating in his first official album, “Victory Lap,” which was released last year and nominated for Best Rap Album at the Grammys. Asghedom collaborated with a wide array of artists, including Rick Ross, Drake, YG, Snoop Dogg, French Montana, The Game, Dom Kennedy, James Fauntleroy, K Camp, Childish Gambino, Jadakiss, and Wale. Hussle and longtime girlfriend actress Lauren London were parents of a 2-year-old, and he was the father of other children from previous relationships. Long affiliated with the Rollin 60s Neighborhood Crips, Asghedom had long shifted his time and interest into technology and development. He developed open-air museum Destination Crenshaw with a group of other entrepreneurs. Since acknowledging his affiliation publicly in 2010, Asghedom sought to provide an alternative to the “ignorance and self-destructiveness in the narrative that was pushed on us through music in our generation,” as he said to Forbes last year. “I see how damaging that was, for myself included, and we’re all subject to the social pressure,” he told Forbes. “I wasn’t above it. Each of us is impacted by what’s going on around us. For me, understanding the platform I have and who it speaks to, it’s about being strategic. Hussle’s killer has not been apprehended and is still at large. Correction: Monday, 8:14 a.m. ET: This story has been updated to correct the spelling of Asghedom’s last name and correct his middle name.